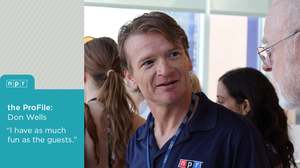 September 17, 2013  The new NPR Ambassador Program is an ongoing volunteer opportunity based at our Washington, D.C. headquarters. Our ambassadors lead daily studio tours, work in our new retail outlet and help during special events. Think you might be interested in volunteering? Get a first-hand account.